Two nights lodging in any of our spacious suites with romantic candlelit fireplace. Flowers and chocolates in your room upon arrival. Gourmet breakfast in the dining room of the Inn or a special breakfast delivered to your suite. Intimate 2-person ceremony (small number of guests by prior arrangement if desired). (Max. 6) Ceremony either in the parlor of the Inn or outdoors under the arbor. Fresh floral bridal bouquet and boutonniere for your fiancé. Choice of non-alcoholic Champagne, cider or sparkling juice for your wedding toast. (You may bring your own alcoholic beverage and we will chill it for you.) Pair of crystal champagne flutes as a remembrance gift. 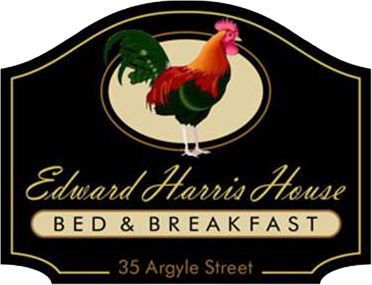 $50 gift certificate to use towards a return stay at the Edward Harris House Inn on your first anniversary. Mother of the bride corsages, flower girl baskets and attendant bouquets. In-room body massage at $75 per hour per person (fee and gratuity to be paid directly to your masseuse please.) Subject to availability. Larger cakes and extra tiers available. Please call for pricing. Note: Prices quoted are subject to change. Reservations are based on deposit and availability. Taxes and gratuity are additional and will be added to your final bill. All photography will be billed directly to you by your photographer. Thinking of an intimate, yet larger wedding or event? Contact the Inn's new 'Affairs of the Heart' Special Events Division for amazing and unusual urban locations that are perfect for your wedding, celebration or event! 800-419-1213 or 585-473-9752.